Powershift transmissions handle high power delivery without heat build-up. Smooth gear shifting and three steering modes ensure that the operator can work in the toughest site conditions. Outstanding manoeuvrability. Reliable components. 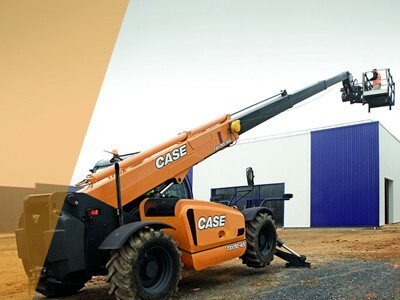 With standard pilot controls for all hydraulic functions the CASE TX telehandler is an easy machine to drive. Load sensing, flow sharing hydraulics, in combination with a smooth Powershift transmission, it ensures independent movement of all hydraulic functions, with precision and accuracy. Low effort control lever reduces operator fatigue, ensuring high productivity and maximum safety throughout the working day. Smooth operation. Precision control. Side-mounted engine with full length lift up canopy ensures access for ground level servicing and regular maintenance. All filters and fill points easily accessible, for minimum downtime and maximum productivity. Main hydraulic valve mounted at the rear of the machine can be reached through separate panel without having to move other components. There is a CASE TX telescopic handler for every task on the construction site. Customers can choose from 14m and 17m working heights, with lifting capacities from 3.3 to 4.5 tons. Wide stabiliser legs (standard on 17-meter model) are provided for maximum stability while lifting on the heavier models, giving CASE some of the highest lifting capacities in the market.